Facebook today launched the App Center it announced last month. The goal is to make it easy for users of the social network to find social apps. “The App Center is the central place on Facebook for finding high-quality social apps, whether they’re on the Web or mobile,” Matt Wyndome, who led the team that built the Center, said at a launch event in San Francisco. The Center isn’t a store so much as it’s a discovery tool. Wyndome said the company realized it needed such a hub when people would consistently ask them how they could find great apps, and the company didn’t have an answer. The Center launches with information on over 600 apps, including Nike+, Stitcher Radio, Draw Something, and Pinterest. Each app in the Center has its own page, with information and screenshots about the app and information about who among the user’s friends is using them. The pages also include links so users can access the apps right away, whether they’re located within Facebook or in the iPhone App Store or the Google Play store. More than 230 million people play games on Facebook each month, the company said, and more than 130 games have more than 1 million monthly users. 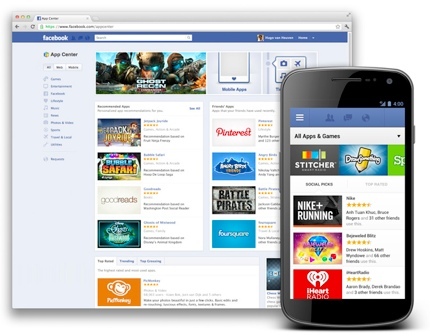 Last month, Facebook drove users to the Apple App Store 83 million times.